It was long believed that a giraffe is a giraffe is a giraffe. 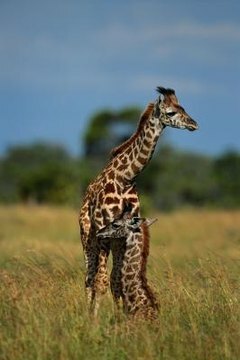 The world's tallest animal was considered to be of one species, Giraffa camelopardalis, but a 2007 study supported by the Wildlife Conservation Society challenged this assumption. Since the study, nine subspecies of giraffe have been identified. Giraffes are easily recognizable, with their long legs, extended necks and beautiful coats. The inclination to lump them together as one species is understandable. However, the 2007 study highlighted geographic differences according to hair coat color, suggesting subspecies that reproduce only within their group. Though giraffes can cover great distances, meaning different populations and species can cross paths, they don't reproduce between subspecies. Recognizing the different subspecies illuminates the sad fact that giraffes are becoming endangered -- some subspecies only number a few hundred worldwide. The G.c. angolensis, commonly known as the Angolan giraffe, isn't found in Angola any longer. The Giraffe Conservation Foundation estimates that there are fewer than 20,000 Angolan giraffes in the wild and less than two dozen in zoos. The South African giraffe, or G.c. giraffa, has even fewer numbers, estimated to be fewer than 12,000 in the wild. These guys sport blotchy, star-shaped spots on a tan-colored background. The Masai or Kilimanjaro giraffe, technically called G.c. tippelskirchi, is the most populous of giraffe subspecies, with less than 40,000 remaining in the wild. This giraffe is noticeably darker than other giraffes, with large, dark brown, jagged and vine leaf-shaped spots mixed in with irregular lines. The reticulated or Somali giraffe's scientific name is G.c. reticulata. In the late 1990s it was estimated that 28,000 Somali giraffes were in the wild; at the time of publication estimates are at fewer than 5,000 in existence. There are about 450 in captivity. Reticulated giraffes have brownish-orange patches defined by thick and extremely white lines. There are fewer than 3,000 G.c. antiquorum, commonly known as the Kordofan giraffe, in the wild. Kordofan giraffes' spots are pale and irregular and cover their inner legs. Thornicroft's giraffe, technically called G.c. thornicrofti, is part of a very isolated population in eastern Zambia, with fewer than 1,500 remaining in the wild and none in captivity. This subspecies has large, ragged, dark leaf-shaped spots set on a cream background. Three subspecies have populations in the mere hundreds in the wild. Rothchild's giraffe, G.c. rothschildi, numbers fewer than 670. Rothchild's giraffe has large, dark rectangular-shaped blotches on a cream background. There are an additional 450 of them in captivity. The West African, or Nigerian giraffes, G.c. peralta, live in an isolated pocket with fewer than 250 members. Possibly the rarest giraffe, it has rectangular, tan-colored spots on a cream background. The Nubian giraffe, G.c. camelopardalis, is similarly threatened. There are fewer than 250 in the wild and none in captivity. This giraffe has a distinctive coat of large, mostly four-sided chestnut brown spots on an off-white background. Wildlife Direct Giraffe Sanctuary: How Many Species of Giraffes Exist? How Does the Tiger Use Its Fur to Survive?